Hi Barry, pleased you like the new site and very pleased you like my books! The video is a random collection of clips of world sports car races, primarily from the mid 80s. I found the clip on YouTube, put together by someone far more talented than me, but thought it very evocative of my days back then. You’ll find pictures of most of my old cars on the “Racing Career” page. I was racing/running my team between 84 to 87 in the WSCC, and there is a brief flash of one of my cars part way through the video! A friend is putting together another video of some of my races/cars and it’ll be on the site very soon. Me again…I also remember the Willhire….and crawling out with parts to back of the circuit to fix Doug Wood’s car in the middle of the night…the other driver with you was a certain Mark Reece? Good days, lots of fun. It may have been Mark Reece… memory fades! 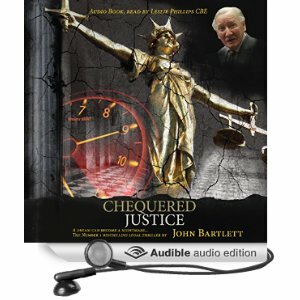 Have you read Chequered Justice yet https://johnbartlett.co.uk/chequered-justice/ ? There’s serious talk of it being turned into a “made for TV” film! Hi I’ve just saw somewhere you wrote about your experience in the group c era . I don’t wanna order the wrong book so could you tell me wich one I should buy. Both books cover my racing history from beginning to end… Dark Horse tells the story from childhood and to getting into racing and making it into the WSCC and Group C. Chequered Justice tells the story after it all went wrong with flashbacks into the racing world. Both books are available in paperback or eBook and the audio book of Chequered Justice (read by Leslie Phillips) is currently being produced…. Also strong possibility of the latter being made into a film for TV! Hi John, thanks for the signing today in Southampton, already started reading Chequered Justice and I am hooked…! Pleased to hear you are enjoying Chequered Justice. After the day signing books at Southampton we had a short break at Brockenhurst in the New Forest, a place both my wife and I love…if you also read Dark Horse you’ll see why! Please do let me know how you get on with the rest of the book and if you feel able to add a review anywhere such as Amazon, I would be grateful. I was a student at Shoreham College as well as being dyslexic, thank goodness for spell check!! I was just wondering as a confused and dazed 19 year old how did you find the motivation and energy to achieve your dreams? I hope to do more poetry and write. How do you keep the flow of writing? In terms of being subjected to turmoil, in the form of bulling and peer pressure as well as society enforcing its views upon a person, I have had my fair share of it. How do you keep yourself calm and focused enough to write and do what you want to do? Hi Spencer, pleased you liked the books. Interesting to hear you were at Shoreham Grammer (Shoreham College). When were you there? In answer to your question, I think I’m genetically programmed to fight bullies, particularly when it’s the State doing the bullying! I think I’ve always been a bit naive with my ambitions and just jumped in and never really considered how long/difficult something would be… or what could possibly go wrong! For myself I started writing when I was older and then always from experience. That’s where the passion reality comes into a book I feel. But there are experiences at every age and I would encourage you to write about the things that happened to you in life to put those down and embellish them with other ideas you may see or hear, and it will grow from there. It sounds as though you already have a passion to do so and there is no reason you cannot succeed. Sending you my best wishes for a long, fruitful and enjoyable life of writing. Please do add a review on Amazon for me! Just to let you know that I just finished to read your book Chequered Justice and I loved it. I read it on the advice of Jonathan Stevens who had told me about your case while I was doing an internship with him in London. As a french lawyer, I was also interested to know more about the british legal system…. Thanks to you I learnt things I would never have been able to learn in books… Thank you for the amazing days I had reading your book while on holidays in Mauritius! Many thanks for your kind comments on my book, Chequered Justice. Please do help spread the word amongst your legal colleagues and friends. If you have a moment, I’d be very grateful if you could add your review onto the Amazon site. I have purchased last year your final season Lola T8800 including the interserie bodies. At the moment I am having some trouble with the rebuild of the engine which is also still original. Do you maybe have some info for me out of the period of your final season? I would also be pleased with any pictures and naturally will be happy to invite you to the first track tests (hopefully) next year. Hi Patrick, good to hear from you and to know that the old Lola’s will be back out and running again soon. There is a very long story behind those cars… hope you will read it sometime (Chequered Justice)! I’d love to come and see the old car run again whenever you get them going, and I hope you have more success than I did with them. Where are you based? I’m not sure that I have much in the way of setup information or engine data but could put you in touch with the chef mechanic that was running the cars at the time. We bought the cars from a chap in Belgium, Daniel Herregods, in 1992, following a prize indemnity race at Zolder. I was dealing directly with the race division of Buick in the US re the engines and engine mapping. I still have a box full of gear ratios for them in my garage if you need any! email me at john@chequeredjustice and I’ll give you my contact info. Regarding info you have : anything is welcome. Whether it is usefull or not, does not matter as I like to make a complete file of all my cars with all possible info and pictures. It would be awesome when you could get me the contact details of the race division of Buick or even a contact that you used to deal with. I am always interested in the gears. Are they still in good condition? Tell me what you would want for them. Chequered Justice – a remarkable book. I was involved in motor racing myself, for a year or so, experiencing life behind the scenes for drivers, sponsors and those who make it tick. I escaped prison by the skin of my teeth for ‘aiding and abetting’ in a subtle multi million pound scam involving those very people. John has written a remarkable book, I was living his story. It gets right to the heart of what a driver goes through: emotionally, practically, financially and spiritually. There is no escaping the fact that Will was genetically ‘hot wired’ to race: you can change a man’s life, but not his passion. Yet this is more than a book about motor racing, it is about the tenacious human spirit of Will Middleton (I could only picture John), the misuse of power and the collusion of those who will do anything to save their own skin – regardless. Sadly they are the gatekeepers of our laws, the men and women we trust to ensure justice is done. Chequered Justice is also a powerful love story. Beth, Will’s greatest ally, sticking by her man, all the way through the tortuous years, enabling him to carry on. When it seemed he’d lost everything, he still had the most precious thing of all: the love of his wife and family. It’s always nice when somebody gives my books a good review, thank you. Especially so when two days back there was a not so good one on DH! You clearly have an insight into that world and what fuels the mentality… something few understand. I’d love to know which old school pal suggested you read CJ (I’d be grateful if you could email me who it was john@chequeredjustice.com). I do hope you’ll like Dark Horse… it’s a different book to CJ. It’s the story of getting there, whereas CJ was the story of the downfall. I think some readers expect DH to be the same type of story as CJ! Inevitably there are a couple of key events that appear in both books, which is unavoidable as the story is, as they say, “inspired by true events.”… but only around 99% or so! My wife is writing the sequel to CJ at the moment. Good of you to respond. It was Ian Little who recommended your book. We met for supper at the George and Dragon with his wife Mandy who I have known for many years. They had both read my book and while we were discussing it Ian told me about yours. I am looking forward to reading Dark Horse and particularly keen to read your wife’s sequel to CJ. She is obviously an amazing woman. I lost contact with Ian after the trial and only a few weeks ago tried to find him on Facebook, but without luck. I had no idea he’d got married or that he’d ever read CJ! Ian was a good friend and was in the original draft of CJ but that part ended up being cut after the editor insisted on at least 10% going! Ian does however appear extensively in DH! I do hope he won’t mind that I describe him as (Chapter 21) “… tall and skinny with short cropped brown hair and a spotty complexion!” and “always famished!” Do tell him that, that for ease of telling the story, as with other characters, I have combined a number of people (mechanics/helpers) into his character! He’s also in at least a couple of other chapters when we were living in an old converted bus with “Deadly Doris” traveling to various circuits. If you’re speaking to him, tell him I made him a combination of Nick, Rex, John & Yeepie (he’ll know who they were)…. And do please ask him to get in contact; it would be great to meet up for a beer (tell Mandy I’ll promise to be on my best behaviour!). Mary (Beth) sends her regards. How kind of Mary to send her regards. Aah. Apologies John – I’ll let ian know and read DH with interest.